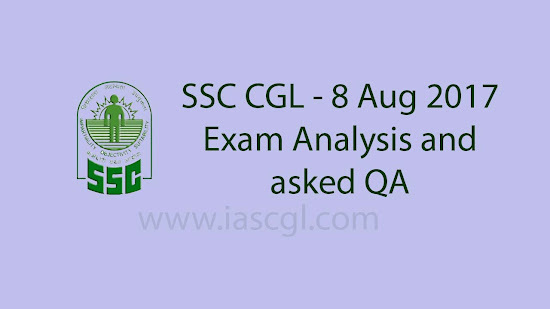 SSC CGL 2017 Tier-I exam review/analysis of exam held today morning/noon/and evening session (8th August).. In this review you'll able to understand exam level of SSC CGL exam helding and you can make yourself ready for that. This year as we're seeing that exam pattern is changing exam by exam and don't think that very similar question will be asked by SSC in every exam, There is a huge change by SSC in English Section, question as we see in last exam are taken from Narration, Cloze and Voice. But please keep in mind that same will not be asked in every exam for be ready for the change too, may be possible that reading comprehension include. Reasoning: Try mock tests, solve max number of que in this because of high accuracry rate. General Awareness: General Awareness, they need to focus more on Medieval History, Geography and Science, and for CA read awards, book Games and Author name of famous books. Itai itai disease caused by? Which state has the largest coastal boundary? How many types of Writs are there in the Constitution? Which country was involved in Jal Sanrakshan Samjhauta? Which movie won Oskar 2017? Monument built by Maharana Pratap Singh? Which acid is present in ant sting? Bud grows from which part of the plant? Who is the ex officio president of the Indian Parliamentary Group? Which event was held for minorities to promote their art and sculpture? Five kingdom classification was given by? Who is responsible for transportation of water from roots to leaves? The slogan swaraj is my birth and Ishall have it was given by? How many calories required to decide poverty in India? Dpsp from which part of the indian constitution? How many fundamental duties are there in Indian Constitution? Rovers cup associated with which sport? Todarmal was part of which Mughal ruler's court? One question related to Vikalp scheme. Questions related to Newton’s 1st, 2nd & 3rd law & Galileo’s law. Maximum GK questions are from sciences. Questions related to primary, tertiary sector.